On Monday, May 23, 2005, FOX affiliate WSVN-TV sent Patrick Fraser, with only a BS in Journalism from UF-Gainsville, to tangle with Scientist Dr. A.K. Dewdney over the 9/11 Pentagon quagmire. Dr. Dewdney: "If we are right the implications are profound." Reporter: "Right or right off the wacko chart, common sense tells you its not likely. In fact common sense tells you its not only outrageous -- its ridiculous and one well known skeptic has another description for it -- laughable." INDEED, 'laughable' describes most of this article. As the pioneer 9/11 researcher Kee Dewdney struck gold when he proved beyond a shadow of doubt that extended cell phone calls from airliners were a fable of the Bush Administration on 9/11. That was the first foot in the doorway to 9/11 Truth. As most Americans are unfamilar with using the Scientific Method in solving problems, everyone should pay attention when Kee Dewdney demonstates the use of the Scientific Method in explaining 9/11. BY THE WAY, the Scientific Method completely funks the Fed Govt. 9/11 conspiracy theory. Firefighter Russell Dodge said. "There were two vehicles burning, along with a construction trailer - we didn't know at the time, but that trailer was the main producer of smoke on the outside of the building. He said the foam units got there and concentrated on the area of the construction trailer, which was producing some severe fires and subsequent mini explosions due to highly flammable chemicals in it THAN on the actual point of impact from the hijacked aircraft. The 'construction trailer', actually a large generator trailer with its own 500 gallon diesel tank, was not used but kept for an emergency. As there was no need for the large extra tank nearby, the tank apparently was filled with a crude oil-diesel oil mixture, similar to an orchard smudge pot, and remotely ignited to create the enormous smoke plume . Note that the smoke from the burning trailer is whitish. 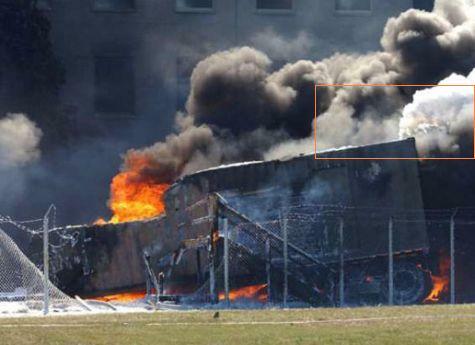 Note that the circled area around the generator trailer was also ignited. 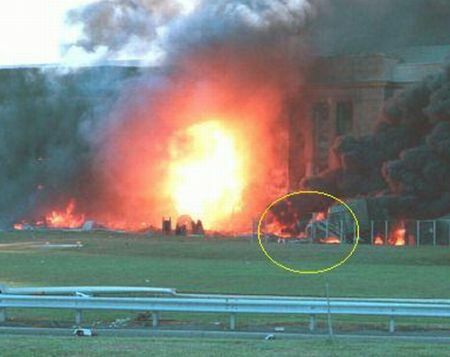 This photo JUST AFTER the Explosion shows a bonfire in front of the impact area with its smoke plume and the Generator trailer area highlighted with its smoke plume just getting a start. Of course, NO Pentagon section down. This photo shows the generator trailer area producing an enormous smoke plume with the bonfire in front of the impact area about the same as the last photo but a better show for the camera shots sent around the world. 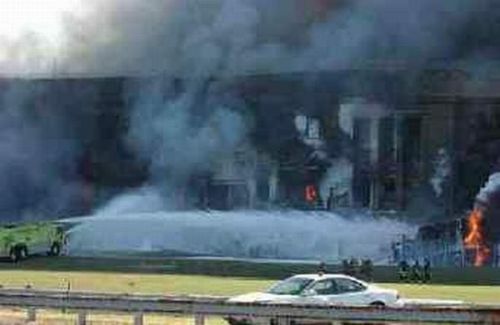 Witnesses said they thought explosive charges were set off inside the Pentagon 'impact area' to make it appear that the aircraft actually passed the front wall when it really didn't. That would explain large fire development even outside the impact area. Here the firetruck is directing foam at the large fuel tank only with a minor fire still burning on the generator trailer. Shortly after 9/11, a panel of Boston area-based civil and structural engineers convened at the Massachusetts Institute of Technology. The main culprits in bringing the famously lofty buildings down, they concluded, were the two intensely hot infernos that erupted when tens of thousands of gallons of aviation fuel spilled from the doomed airliners. 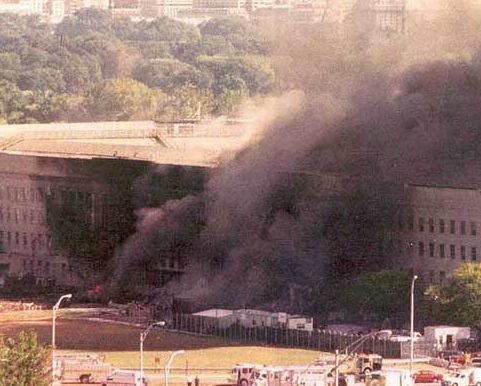 IN A RARE EPISODE of 9/11 Truth reporting, the NY Times plied loose a tape from the DOJ, FBI Video & Tape Collection claimed held for 'national security' but seemingly held to protect the criminals behind 9/11. 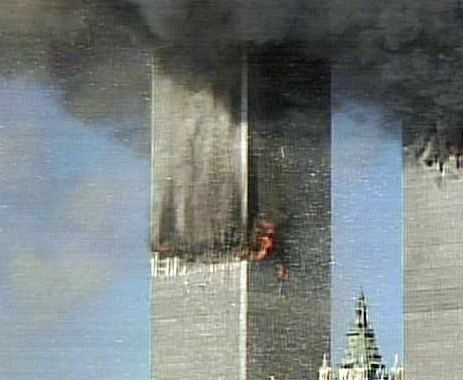 IN MORE 9/11 Truth REPORTING Reporter Tom Flucco interviewed Presidential candidate Karl Schwarz who said "there are about 150 retired and active U.S. military and federal intelligence officers who will come forward and testify regarding government involvement in the September 11 attacks--but only if there is a serious criminal grand jury." Apparently NY AG Spitzer and NYC DA Morgenthau are involved in Obstruction of 9/11 Justice. We have heard reports indicating that the New York federal grand jury in Albany is so displeased with Spitzer and Morgenthau's paucity of action and lack of subpoenas or indictments over 9/11 (given the evidence already handed over) that it has assumed its own independent constitutional and federal authority to take control of the criminal proceedings. 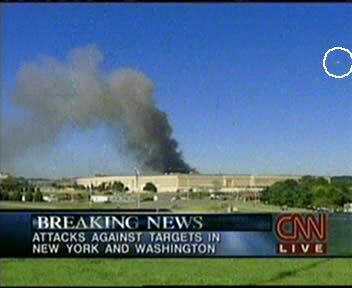 No matter how high the federal officials or elected representatives implicated, or which print and electronic media executives committed obstruction of justice to cover up criminal evidence, or which military and government officials supervised the two-hour Air Force stand-down during the attacks, New Yorkers who elected Spitzer and Morgenthau (and all Americans who trust them with their personal safety and protection in their jurisdiction over 9-11 criminal proceedings) have a right to expect the two to proceed full bore with obvious, credible, and prosecutable evidence that the U.S. government played a part in the September 11 attacks. This includes the above Pentagon-related evidence. 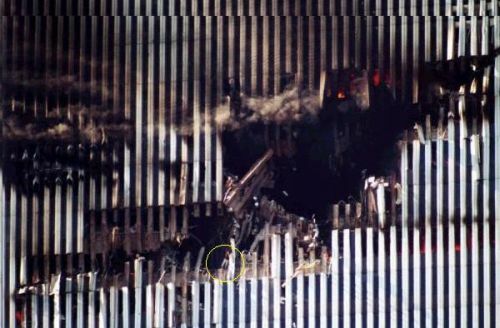 The North Tower Smoking Infero didn't originate at the crash area. A victim is circled in the first photo.. 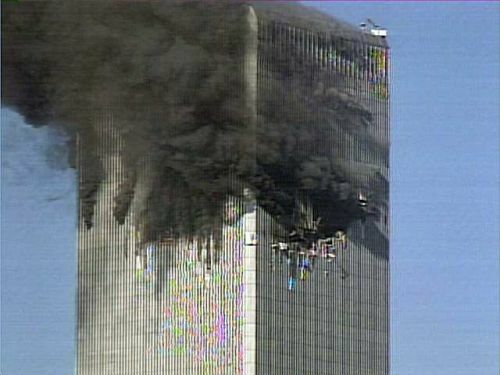 This photo shows a SINGLE North Tower floor resembling a smudge pot putting out vast clouds of black, sooty smoke just like at the Pentagon . Certainly a steel structure with 4 inch concrete floors would normally have little combustible material. 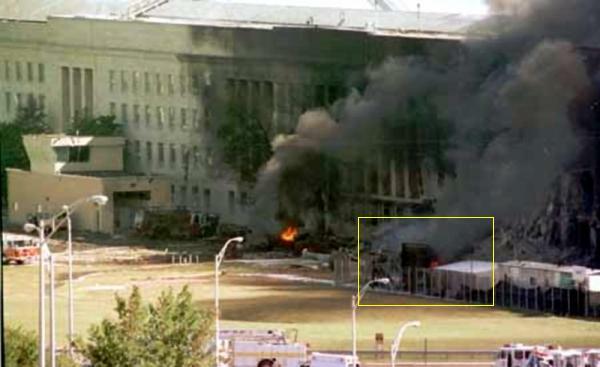 AS only 17 minutes expired between crashes AND a black smoke plume was required to hide the helicopter operating above the South Tower before, during, and after the South Tower crash, this floor probably contained barrels of crude oil-diesel fuel mixture that was remotely ignited TO ENSURE A HIDING PLACE FOR THE HELICOPTER. Didn't work as cameras galore caught it in action. 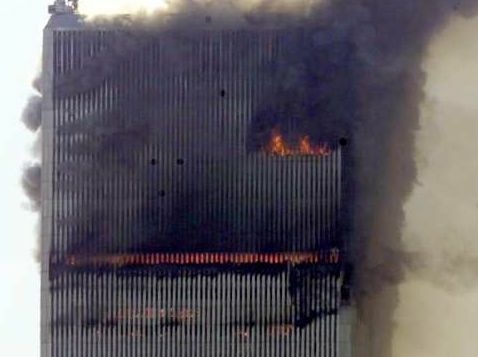 See the RENSE article On 9/11 An Ill Wind Blew to Booker School for the full story about the need for a smoke plume that also implicates criminals in and out of federal government for 9/11. 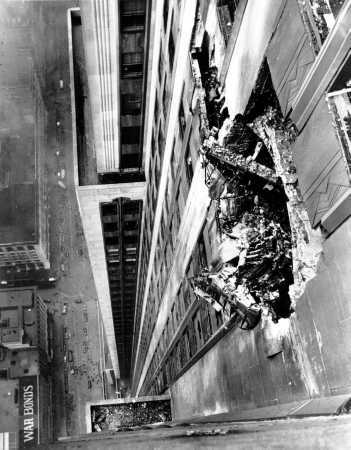 In 1945, a USAF two-engine B-25 bomber crashed into the 79th floor of the 102-storey Empire State Building in Manhattan. The crash occurred during a misty night, and the damage was restricted to the impact area. When the plane crashed, one of its engines whizzed from the north wall, and through the south wall, ultimately landing on the roof of a nearby building. Debris from the building and plane also severed through elevator cables, and sent two cars and passengers into freefall. "We were horrified to see a B-25 half in and half out of the Empire State Building." 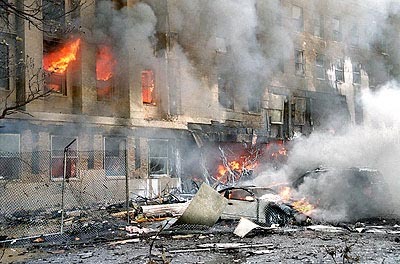 The fire caused by the bomber's high-octane fuel was extinguished WITHIN AN HOUR by New York City fireman. Most important of all here is the Karl Schwarz group's plan to reverse the decline of America.